Keith Krumwiede’s Freedomland, an exhibition of architectural misfits, suburban follies, and developer nightmares, that just closed at the Princeton University School of Architecture Gallery, defies easy categorization. 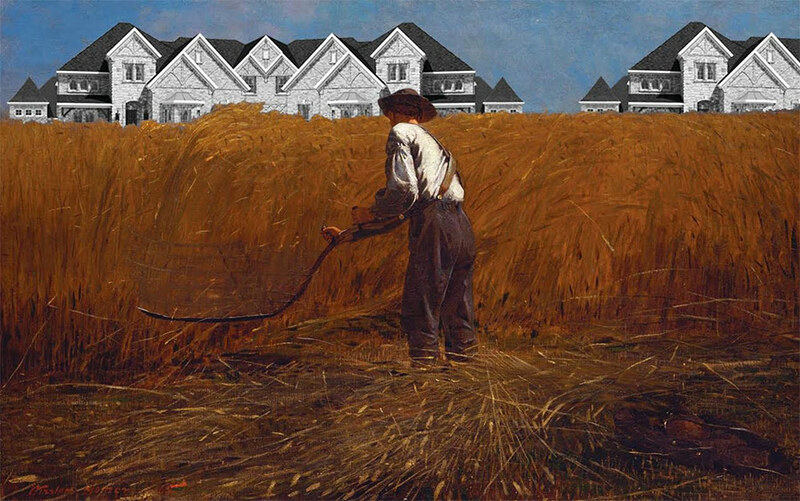 The pulse of the work is strong, its intention clear: to satirize the cringe-worthy packaging and wholesaling of a particular strain of the American dream of mass-produced, individualized suburban living by Toll Brothers and others through a series of reconfigured catalogue house plans. 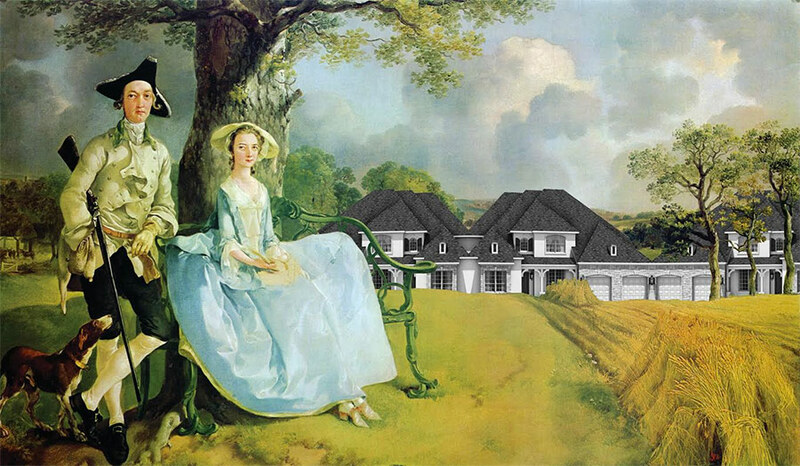 Producing their own kind of suburban fantasy, these new, recombinant figures populate an expandable Jeffersonian grid, complete with estate names like “Neo-Palladian Acres” and “The Villas at Broad Acres.” Several scenes of Freedomland are rendered as oil paintings after well-known American pastoral tableaux (in the show, the images are projected, but they were actually “painted” in China, of course). Others are shown as meticulously drafted arrangements of estates into neighborhoods and townships, each following—in their imaginary histories—a strict narrative of “cyclical regeneration” aimed at ensuring the vision of Freedomland as the most superior settlement plan in the history of American town planning (so claims the “literature”). A third part of the project, called A Game of Homes, pushes the representational qualities of the work toward absurd ends in a series of compound plans and elevations derived from the banal graphics of the catalogue drawings. At the center of any satirical project, whether political or social in nature, is a question of the target and the audience. If there is no correlation between the intended subject of the criticism and those meant to understand the attack, little friction exists, and little progress can be made. In other words, when one preaches to the choir, he rarely faces resistance. 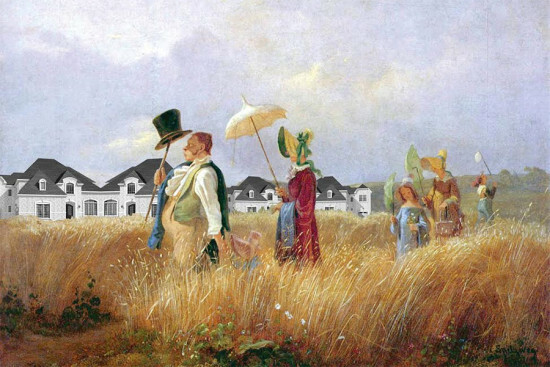 In the case of Freedomland, it is doubtful that any of the presumed targets—Toll Brothers, David Weekley Homes, etc.—have much to do with the world comprising the audience, that is, a certain subset of students and academically-minded architects interested in testing the discursive limits of architecture and urbanism. If not in its satirical function, the value of Freedomland as a pedagogic exercise may be in its extensions out into the discipline, both its recent past and current provocations. The Stirlingesque aggregations of A Game of Homes (thus far only in its infancy as an experimental planning mechanism), for example, suggest preliminarily a different model of housing that is much more radical about its programmatic and spatial ambitions than most proposals today. Likewise, the gesturing of Freedomland toward the difficult typological and graphic expressions of firms like Dogma and KGDVS, in which the idea of absence is often more powerfully represented than presence, brings the work into poignant dialogue with contemporary architecture, narrative, and social function. Ultimately, perhaps the greatest value of Freedomland is that it forces us, however timidly, to reconsider not only the current state of housing and its political, economic, and social structures, but also the nature of planning proposals in general, ranging from the polemical to the possible. November 30, 2017 What if everything you know about the suburbs is wrong?